The eruption of the mud volcano Otman Bozdag, one of the world's largest mud volcanoes, poses no threat to the area, the Ecology and Natural Resources Ministry announced on February 7. “As a result of the volcanic eruption, the flame rose to the height of 350 meters. Mud waste covers an area of about 10-12 hectare. There are 3-4 meters deep cracks in area in the south-west direction. At present, there is no activity in the area, fire is completely extinguished,” the ministry said, adding that expertise work is currently underway in the area. The Azerbaijan National Academy of Sciences (ANAS) earlier announced that two eruptions were recorded in the territory of the Sangachal settlement, Garadagh district on February 6. “The first eruption was recorded at 12:20 and the second at 14:18 local time in 31 km north from the Shirvan seismic station of the Republican Seismological Service Center at the ANAS. The first eruption lasted for 3 minutes 23 seconds, and the second eruption lasted 6 minutes.” the ANAS told APA. The ANAS reported that the second eruption was of the Otman Bozdag volcano, which last erupted 13 years ago, in 2004. The Ecology Ministry further added that the activation of other mud volcanoes in this area is still a topical. However, an activation of mud volcanoes in other sides is not observed. 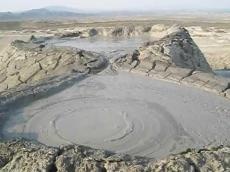 The Otman Bozdag volcano was added to "A group of mud volcanoes of Baku and Absheron State Nature Reserve" in 2011. Azerbaijan is a world leader, not only for the number but also for the activity of its volcanoes. Roughly 350 out of over 1000 mud volcanoes in the world are located here. Some 60 percent of these volcanoes are active. Azerbaijan's mud volcanoes definitely should be part of any tourist's itinerary. Most are located on Absheron, around Baku. There are 100 near the Gobustan Reserve alone. There are another 200 on the islands of the Baku archipelago and in Shamakhi and Shirvan regions, two hours’ drive from Baku. Mud volcanoes are one of the visible signs of the presence of oil and gas reserves hidden deep beneath land and sea in the Caspian region. Azerbaijan's rich fields of oil and gas condensate such as Lokbatan, Garadagh, Oil Rocks, and Mishovdag were discovered near mud volcanoes.